Something for everyone down here on Kappabashi. On the way home from the library, in a restaurant-supply store beside a Chinese eatery, you buy a bath-time utensil. An oke, hand-bucket. Okuda Shoten, at the north end of the street. 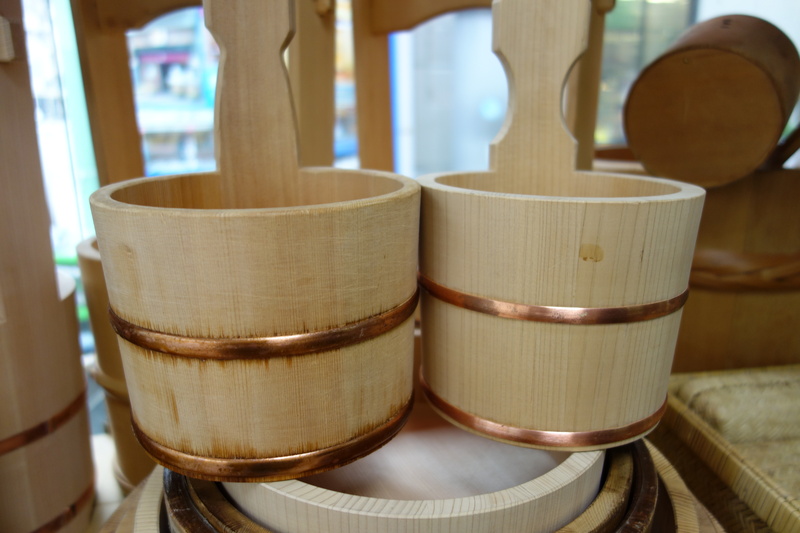 Wood, bamboo and synthetics. 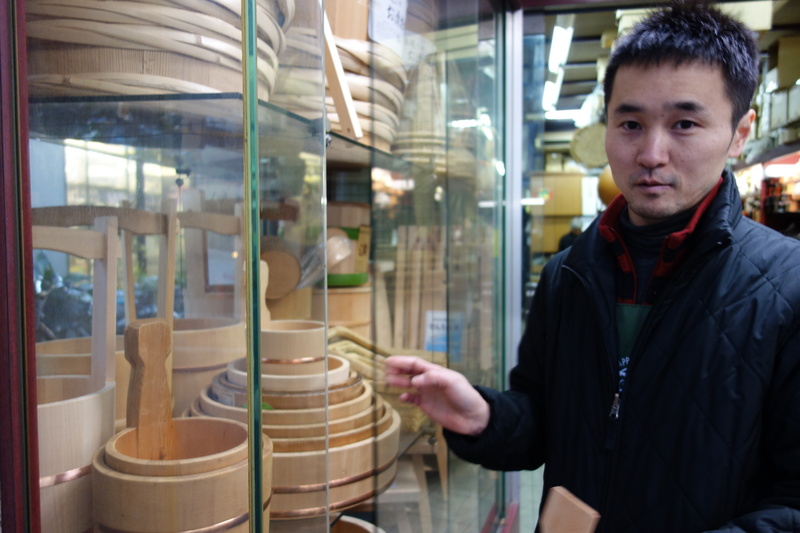 Some nice baskets, graters, lacquerware, ornamental boats to serve sashimi. Some extremely plastic bonsai. The oke catch your eye from their glass cabinet. They look fragrant of naked wood. They make you think of sluicing all over with hot water, before a bath. These winter nights that never stop. Or with cold water in summer. Either way, a change from the shower. Sit and sluice! From the street, you call into the shadows. Excuse me. Can you tell me about these buckets, these oke. How much are they? The shop manager comes out. He is youngish and likes to talk. He opens the cabinet. We have two models, this one is handcrafted, this one is mass produced. The handmade one has obviously been on display for a while, it is a bit the worse for wear. Sap has leaked across the base and around the copper straps. 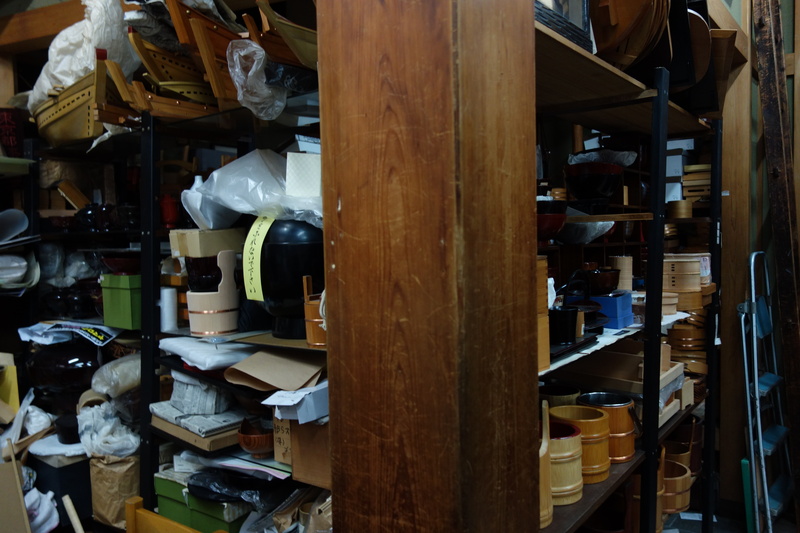 They are sawara wood, he says, a type of cypress. Maybe only found in Japan. The handmade one is about double the price of the other, 6,500 yen. See the grain on the handcrafted one, it’s much closer together. That’s because the tree was older. That means there will be less difference in shrinkage and expansion. That could be good over time. And to tell the truth, I can’t guarantee this handmade one will last twice as long. And see under here, he says, there’s some nice bamboo trim around the base. The cheaper one doesn’t have that. The copper bands are thicker too. And I’ve seen on TV how they adze out the insides, all by hand. Though I couldn’t say there’s anything really wrong with the factory one. And to tell the truth, I can’t guarantee this handmade one will last twice as long. Where is it made? I can’t tell you, he says. It’s a trade secret. But somewhere in Tokyo’s 23 wards. You have often passed by Okuda, but you’ve never been in until now. The building stands proud, not in a strip like the other shops. We’ve been here about 80 years, he says. The boss is third generation. Hahaha. He steps onto the street and points up at the sign. Three bold letters, in the katakana script usually used for foreign words. O. Ku. Da. You see, he says, it says Okuda. But my name is Yukio Sekita. Mr Okuda is inside. I married his daughter. Do you know the cartoon Sazae-san? Well I am like Masuo. The son-in-law. It’s unlikely we will have a Sekita running this shop called Okuda. Especially as Mr Okuda already has a son! Hahaha! You decide on the handcrafted model. Sekita goes to fetch a new one. But the one he brings back has no bamboo trim. Perhaps that’s the human factor you get with handmade. The craftsman must have forgotten it, says Sekita. So you go for the old demo model, because you like the bamboo, and Sekita gives you a small discount. And instructions on how to dry it out. Wipe it and rest it on its side, he says. People put them upside down but then the rim will blacken with mold. And don’t use soap! A couple of days later you pass Okuda again, and Mr Okuda is at the counter. He tells you how there used to be a river running outside where the shop is now, and he lends you a book on the 100th anniversary of the Kappabashi shopping street. He says the building is postwar. It just looks older. He says, We have a splendid pillar, don’t we? It’s hinoki cypress. One piece. Why is the shop name in katakana? Mr Okuda says, My father changed it from the proper kanji Chinese characters in 1953. When my father ran Okuda, he used to sell only traditional lacquerware. But he couldn’t make ends meet so he started to carry wooden things, and bamboo and then plastic. So he changed the characters. Katakana may have seemed more “modern” at the time. You know, those letters are made of wood, then lacquered and covered in real gold leaf. But that sign now would not be the original one, he says. It would have been re-done a couple of times. You can still see the old sign, the kanji one, at our other store up the other end of Kappabashi. It’s up high, up the back, darkened with age. Go and see it. He looks at his watch. But you can’t go now, as the shop closes at five, and it’s past five.